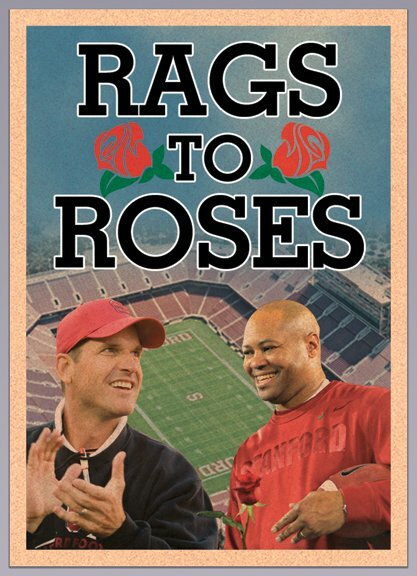 The Daily is proud to announce its upcoming book, “Rags to Roses: The Rise of Stanford Football,” by Joseph Beyda, George Chen and Sam Fisher. The book will be sold electronically starting on July 15, and we will publish several excerpts in the coming weeks, beginning with today’s installment, the book’s preface. Visit www.stanforddaily.com/ragstoroses to sign up for updates on ordering information and future excerpts. Those using the mobile version of the site can scroll down to the bottom of the preface to sign up. The Beyda family’s remote control was very busy that night. Versus, ESPN, Fox Sports Net, local news, rinse, repeat. Stanford had just upset No. 1 USC, and there was no way we could get enough of it. Not after five years of suffering through Buddy Ball and quick kicks, five years spent with neither the Axe nor travel plans for bowl season. Not after 1-11. Hour after hour, station after station, we watched the next round of highlights. And each time, when Mark Bradford jumped up and caught Tavita Pritchard’s lob to put the Cardinal ahead 24-23, one thing became a little clearer: We would never, ever forget October 6, 2007. Five and a half years later, Pritchard draws the play up for me on a whiteboard in the quarterbacks meeting area in the Arrillaga Family Sports Center. On the other side of the building, the Axe rests safely in its true home for a third straight offseason. Down the hall sits a 2013 Rose Bowl trophy that not even the most biased Stanford fan — and I rank up there — could have imagined before 2007. Outside stands the skeleton of a new, 28,350-square-foot addition that will serve as the new home of the burgeoning football offices. But it all began here, one Sunday half a decade ago, when a fearless young quarterback rushed to this very same room to watch film on the Trojans. Pritchard had six days to prepare for his first career start, on the road, for a 41-point underdog facing the best defense in the country. Boy, the world wasn’t ready. We found that out early on, when Versus announcer Ron Thulin screamed, “Touchdown USC!” on Bradford’s game-winning catch. In the five years that followed, every ounce of progress by the Stanford football program was met with a half-ton of skepticism. The Cardinal couldn’t retain its physical identity in 2010 after the loss of its workhorse, Heisman Trophy runner-up Toby Gerhart. It couldn’t find the character for another BCS push in 2011 after its fiery leader, head coach Jim Harbaugh, was replaced by the calm David Shaw. It couldn’t compete for the 2012 Pac-12 title after the graduation of the best player in school history, Andrew Luck. But Stanford did all of those things, culminating in the Rose Bowl win this past January that Cardinal fans had been waiting for since 1972. And this offseason, the rhetoric has changed dramatically. Despite the loss of Stepfan Taylor, the top rusher in Stanford history, the 2013 Cardinal has been dubbed a preseason top-five team by ESPN, Sports Illustrated and CBSSports, is seen by many as a favorite to defend its conference title and is projected to be in the running for (dare I say it?) a national title this fall. Anything less than a fourth straight BCS bowl appearance would be a clear step back. Those expectations are the result of one of the most remarkable transformations in college football history — at one of the most remarkable times in college football history. In the era of the spread, a finesse offense reinvented itself as a physically imposing, run-first attack that used more tight ends and fullbacks on a single drive than most of its opponents had on their rosters; in the era of short college careers followed by lucrative professional ones, a once-in-a-generation quarterback stayed the course for a third shot at a conference title; in the era of recruiting violations at USC, improper benefits at Ohio State, a lack of institutional control at Miami and altered grades at Auburn, a team at an elite university that had never gone to four consecutive bowls or won 11 games (and was on the heels of the worst season in school history) decided to become one of the most confident — and most successful — programs in the country. It’s a story that we at The Stanford Daily believe is unique in the world of sports, which is why George Chen, Sam Fisher and I embarked on this project, “Rags to Roses: The Rise of Stanford Football,” this offseason. We have talked to more than 20 current and former players and coaches, spanning four coaching staffs, eight graduating classes and every position group on the field. In part, this book is about the men who dominated the quarterbacks room in the years since Pritchard’s first film session as a starter: Harbaugh, Luck and Shaw. But it’s also about Shannon Turley, the man who dominated the weight room one floor below. It’s about Gerhart and Taylor, the mild-mannered running backs who rushed for a combined 7,822 yards at Stanford, but it’s also about Alex Fletcher, Chris Marinelli and James McGillicuddy, the cocky, trash-talking linemen who stood up to an out-of-touch coaching staff and became the heart and soul of a beaten-down team. It’s about Owen Marecic, the player who could seemingly do anything, but it’s also about Jordan Williamson, the player whose one task eluded him in the biggest of moments — and then served as his redemption a year later in a game that meant even more. Each carries his own tale, and they have told them well; our interview total is rapidly approaching 24 hours as we enter our last round of phone calls and post-workout sit-downs. But what has surprised us most of all is just how eager the former members of the program are to explain Stanford’s ascendance. There is no doubting their pride. For George, Sam and me, “Rags to Roses” has become the 10-unit class we never planned to take. For you, we hope it serves not only as a celebration of Stanford football’s recent accomplishments, but as the story of the men who brought this program back to life — and then took it to new heights. Contact Joseph, George and Sam at ragstoroses@stanforddaily.com. Learn more about the authors.